Welcome to the Adventure Passport, where I'll be sharing all my adventures around the world! There he was, a speck of white in the distance, lying there on the rocks, sniffing the air as our boat drifted with the current toward him. My heart was racing. They say animals can sense excitement and fear, and I have no doubt in my mind that he could sense the feelings and emotions of all 14 people on our boat. Let's rewind a few days to when I was walking through a glass tube underneath one of these enormous giants. 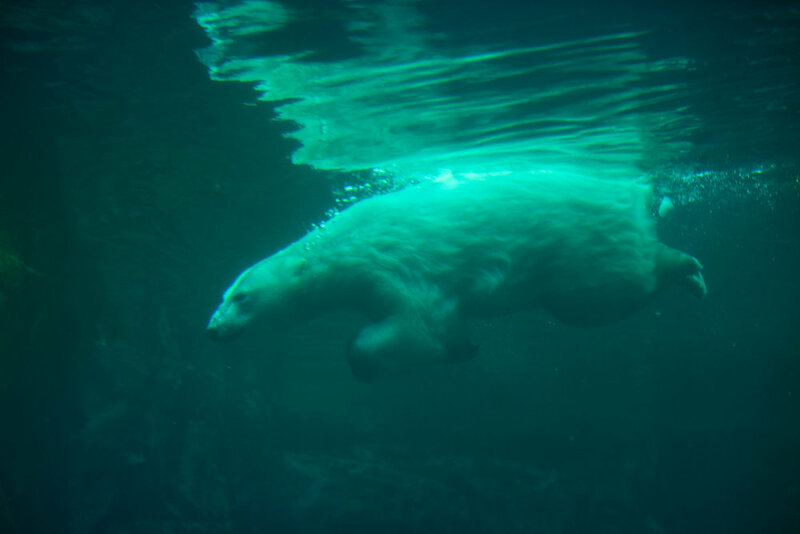 I watched as this orphaned polar bear splashed around in the pool at Assiniboine Park Zoo in Winnipeg, trying to stay cool in the scorching summer heat. Home to the International Polar Bear Conservation Centre, this zoological exhibit currently houses nine polar bears, nearly all were orphaned at a young age. It was an incredible opportunity to learn about these animals before we travelled north to Churchill in hopes of finding them in the wild with Lazy Bear Expeditions. A smooth two-hour flight from Winnipeg with Calm Air brought us to the town of Churchill on the western shores of Hudson Bay. Looking out of the plane window, you could see an enormous expanse of land. The trees began to get smaller and smaller, the boreal forest giving way to Arctic tundra. Ambitiously, I looked for polar bears for the last half an hour, finding every white polar bear-looking rock in the landscape imaginable. “Ladies and gentlemen, welcome to Churchill, Manitoba,” a voice welcomed us over the plane's intercom. Touchdown. Within minutes I was standing inside the terminal building gazing up at the enormous warning signs, educating visitors on bear safety. A little while later, Deb, from Lazy Bear Lodge called my name and I joined her, along with other guests of the lodge, on the seven-minute bus ride into town. A roaring stove greeted us at the entrance to the lodge — a welcome warmth on a chilly Churchill day. Temperatures can vary enormously here any time of the year, especially with winds picking up over the tundra and Hudson Bay. Everyone gathered in the communal area to learn more about the itinerary — all weather dependent — and to learn more about bear safety. Churchill is known for beluga whales more than it is polar bears during the summer months. Thousands of belugas flood the mouth of the Churchill River to calve and enjoy the warmer temperatures out of Hudson Bay. 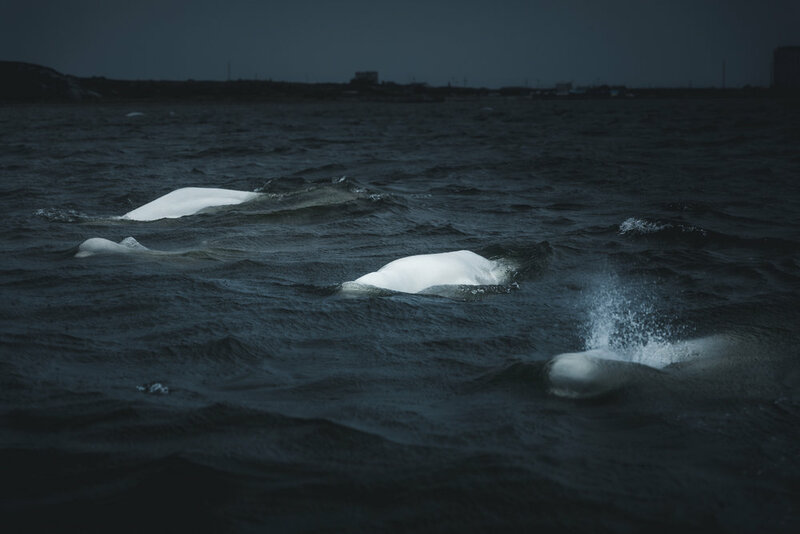 Our visit gave us the opportunity to kayak with these beautiful white ghosts of the ocean. As I kayaked, the whales surrounded me, curious and playful. Every time I picked up some speed, one would begin to tail my sea kayak and occasionally bump it forward. While this region has a huge variety of wildlife passing through, like caribou, Arctic fox and snowy owls, there wasn't any other animal that caught my attention more than the polar bear. 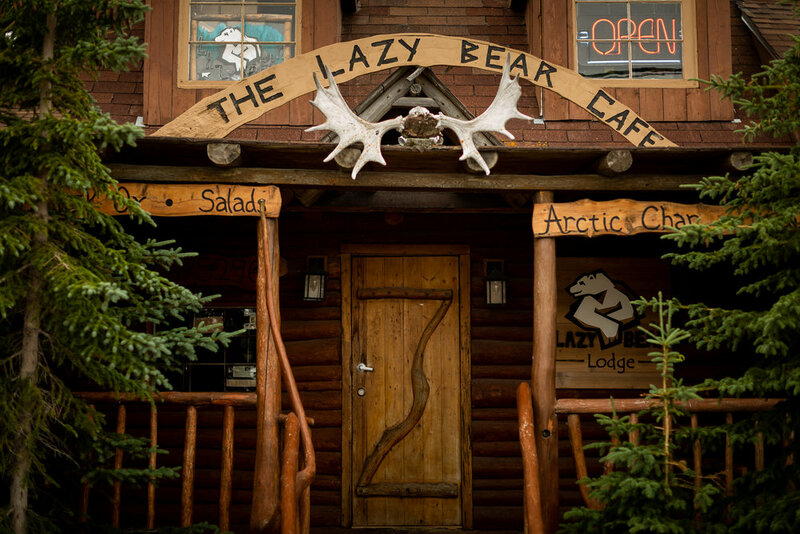 The different groups at Lazy Bear Lodge all get the opportunity to take an eight-hour excursion on a boat in an attempt to see the bears. There’s never any guarantee. After all, they are wild animals, but that didn’t stop us all from becoming fixated on the idea of seeing at least one. The time had finally come for our group to head out on the boat. All 11 of us (plus three staff) put on our life suits and made our way down to the dock. It was a 90-minute journey to a place where the bears are known to spend their time during the day. We left the safety of Churchill Harbour and made our way out onto the Arctic Ocean. It was eerily calm. The water was like a mirror reflection of the sky — even the guides commented that they hadn't seen it this calm before. Temperatures began to plummet as we made our way farther out and northward. I hugged my thermos full of hot tea and settled in for the ride. The engines slowed down and I awoke from a nap. The gentle motion of the boat had sent me to sleep. I looked around; the guides had their binoculars out and one pointed in a direction towards the rocks on the horizon. The silence and feelings of anticipation were overwhelming. Our hearts began to race. Was this the moment we had all been waiting for? I looked around and couldn't see anything — my 100-400 lens wasn't as good as the binoculars the captain had. I kept looking for his reactions as he scanned the horizon, then he raised his hand to another guide with three fingers up. Was he signalling that there were three bears? That's when I saw it, a speck of white on the rocks in the distance. As we got closer I began to make out two black eyes, a nose, long claws and an enormous body curled up. The boat engine stopped; we gave the graceful giant plenty of room. The current of the water continued to take us closer and closer. After days of anticipation and nearly a decade of dreaming of seeing one of these animals in the wild, it was finally happening. A few minutes later we spotted another male, camouflaged on the rocks fifty meters away. I couldn't believe it — two polar bears side by side. A few more minutes passed by and another bear crested the rocks on the horizon, this time a few hundred meters away, and accompanied by a little cub. We had four polar bears in front of us — it was overwhelming! We watched in awe for 20 minutes before the one closest to us retreated to the grass. The engine started, and we slowly made our way further north along the coastline. Eyes and binoculars scanned the rocks in every direction, anything white catching our attention. It wasn't long before another bear was spotted and we slowly went in its direction. This time, we stayed quite far away. This bear was swimming in the water and only its back and nose were visible most of the time. We watched for a few more minutes, but time was no longer on our side and we had a long journey back to Churchill. It didn't take long for everyone to sprawl out on the floor to escape the wind, and most fell asleep. We were all exhausted from the excitement and fresh air. An hour or so later, everyone woke up to the sounds of text message alerts as we got back in to cell service. Before we knew it, we were dwarfed by the enormous grain elevator and port of Churchill, an icon of this remote northern town. The atmosphere was electric for the rest of the day — all of us on a high from such a special experience. I think there was a little bit of doubt in everyone’s mind that we weren't going to see any bears, and it was nice to finally put that to rest. Sadly, my time in Churchill was drawing to an end and it was time to leave this charming part of Manitoba and return to Winnipeg then back home to Vancouver for me. A decade long dream of seeing polar bears in the wild finally came true. Written in partnership with Travel Mindset and Travel Manitoba. As usual, all thoughts and opinions are my own. Aug 31 Canadian photographers you need to be following on Instagram! Feb 9 10 Reasons You Need to Ski The Big 3!